Premier Provider of Portable Self-Storage Solutions in Queen Anne’s County, Maryland! When you’re boxing up your stuff for a big move, or simply need a place to keep a few extra items, you may find that there’s just no room to store everything in one place. Let SMARTBOX take care of your storage problems! Whether you own a retail space in Queenstown Premium Outlets or you live in a neighborhood in Queenstown or Centreville, MD, you can depend on our team at SMARTBOX to provide you with affordable storage solutions. We work to resolve the frustration that comes from keeping track of everything when you’re in transition, which is why our team works to streamline the process for you. SMARTBOX provides the absolute best balance between low-cost and low-hassle moving and storage in Queen Anne’s County. When you need convenient storage options in Queen Anne’s County, MD, you can count on SMARTBOX. Contact us today to learn why your neighbors have entrusted us to provide moving and storage solutions in Maryland! RESERVE TODAY! Give us a call at 301-683-6111 or fill out the form on this page to reserve your portable storage containers in Queen Anne’s County, Maryland today! Don’t see your storage need listed above? Give us a call at 301-683-6111 to hear about our storage solutions in Queen Anne’s County! With conventional self-storage facilities, you have to pack your car or truck with your stuff, travel across town, find your unit, unload your stuff and then drive back to your home or office. With SMARTBOX those days are over! Our unique portable storage boxes take the hassles out of the moving and storage process because we will bring storage containers directly to you in Queen Anne’s County. With us, the containers come to you, when, and where you want them, and then leave again just as easily. Whether you’re moving or need to store your excess belongings temporarily—our storage experts can assist you with your move or storing of your personal items to or from the Queen Anne’s County area. Our storage pods can be brought right to your location so that you never have to drive across town. Another great advantage is that you only pay for what you use. Our SMARTBOX portable storage units are just the right size so that you don’t end up with wasted space. If run out of room have another storage pod container delivered. Load and unload on your schedule and avoid late fees and penalties for taking too long. Its storage and moving for the 21st century. You can take a few hours to load your containers or a few days. It’s entirely up to you and your schedule. Our containers fit easily in fairly small spaces, and are highly weather resistant, so it’s safe to leave them outside while you load and unload. Are you tired of parking your car in your driveway? Have you forgotten that you actually own a walk-in closet? Do you need more space to help control office clutter in the Washington County area? If you answered yes to any of these questions, you could benefit from our storage solutions. SMARTBOX provides convenient, portable storage, all at a price you can afford. With our space saving solutions, you can pull your car back into your garage, you can see your closet floor again, and you can gain control of office clutter and let your business continue to grow and thrive. 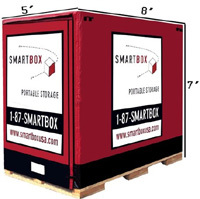 SMARTBOX can help with all of your storage needs in Maryland! We offer a wide range of portable storage solutions in Queen Anne’s County, MD. Some of the most common reasons people come to us include: affordable storage, best storage, mini-storage units, mobile storage, office storage, outdoor storage, public storage, storage boxes and containers, storage rates and prices, storage quotes, storage solutions, storage space, and temporary storage. Reserve Your Storage in Queen Anne’s County Today! When planning a move, you’re already experiencing unnecessary amounts of stress. Let SMARTBOX lift the weight off your shoulders by providing you with excellent storage solutions that will make your move to or from Queen Anne’s County pain free. If you’re looking for a storage and moving company in Queen Anne’s County, SMARTBOX is here for you. We can handle all your storage and moving needs, and we’ll make the process simple! And don’t forget to check out our coupons page to find great savings on your portable self-storage and moving services! Contact us online or by phone at 301-683-6111 to reserve in Queen Anne’s County and the surrounding area today!